Regular readers of my blog probably know that I like to stretch my already gigantic brain by studying a talented dead artist every month (yes, that was dripping with sarcasm, for those who believe I'm a raving egotist)(I'm only a minor egotist. It's hereditary). Normally I group-study with my pals at Fine Line Artists but we decided to make the summer months "Wild card" months as we all have strange show schedules and varying interests. We were starting to sound ominously like a bunch of mothers trying to organize a play date around soccer schedules. Far better to study on our own for a few months! The last artist I studied that really helped my work out was John Singer Sargent, and he shared a lot in common with Parrish -- he too left records of how he worked, he was prolific, and he made a very pragmatic living off his work. I don't have much time for arsty fartsy role models who starve for their vision. I hated the Van Gogh month. The artistic whiner! Move out of your parents' house and start selling those $#%^ things! I prefer learning from those who painted their visions and paid the electric bill. Why? Because I want to learn more than artistic technique from them. I want to learn from their charisma, chutzpah, dedication, ballsiness - whatever it was that made them make it when so many didn't. I know it's not just talent that gets you there. So I want to know how they did it. Anyhoo. Back to Parrish. Wow. His career spanned decades and his style rocked the illustration world. 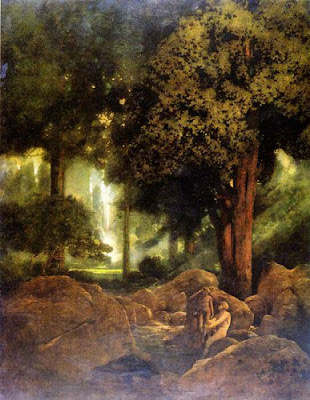 His unique method of painting (thin layers of paint interspersed with layers of varnish) left his originals in ruins after his death, but that didn't really matter: Parrish's money was made in prints. Calendars, specifically. Yes, the originals sold -- and for a pretty penny (nowadays they have brought six and seven figures) -- but the prints were what paid the bills. His lighting is intriguing. 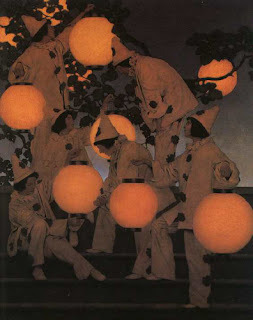 More often than not, his figures were backlit, much darker than the background, which was brilliantly lit and detailed. But it worked. I have to find out why. I can really get excited about what this could do for my art! Anyone else up for the challenge? The only requirements are you blog about it, do your best to learn something from the man and then create a piece of art influenced by Parrish (or you can do a direct copy -- very accepted method of learning and I really recommend it). Here are some links to get you started. I'll be posting more about him this month as I figure out what I'm going to do as my Parrish project. I don't have any shows pressing on me at the moment, so I should have some time to donate to this. Let's go! Whoo! And two more links about the 'Mische technique' by Bridgid Marlin and Cynthia Re Robbins. I'm really looking forward to seeing you're take on a Parrish/Stiefvater piece! btw: thanks for linking to my blog - could you change it to the main page URL? 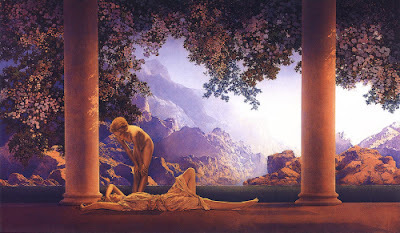 Parrish is currently looking a bit romantic and historical to me..... and reminds me a bit of Waterhouse which was the artist of the month who didn't wow me - but I know he did you and I can well understand why you like Parrish so much. I'll have to see whether I can tempt you! WOW! He does great work! Thanks for sharing! 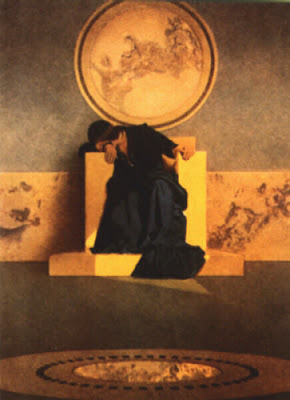 Just to be a fly in the ointment, it's interesting that my guy Rothko took time out from his whining in his 1940 book to "dis" on Maxfield Parrish. Full-on sour grapes because his govt. money was being cut off. I don't agree with him, and I, for one, am into illustrators. Andrew Wyeth, Norman Rockwell. I look forward to your MP month, especially because of your passion about it. Go get 'em! 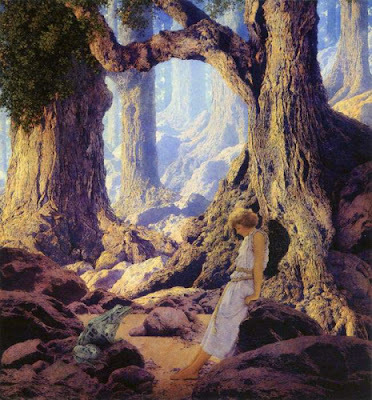 Parrish and Sargent are two most inspirational artists. Thank you for questioning the 'distinction' between artist and illustrator. I had the pleasure and surprise to view an original Norman Rockwell that had been published as a POST cover. It was not painted as an art piece, but had been 'constructed', for lack of a better description, to accomodate the photographic reprint process of the time. There was a newspaper in the illustration being held by one of the subjects, and he actually glued a real newspaper to the canvas. A large red area was a piece of red fabric glued to the canvas, because it registered as 'red' better than paint in the reproduction process. All very intriguing. Gave me a much better perspective on the "making of art". greywarenart.blogspot.com is very informative. The article is very professionally written. I enjoy reading greywarenart.blogspot.com every day. Hi!!! 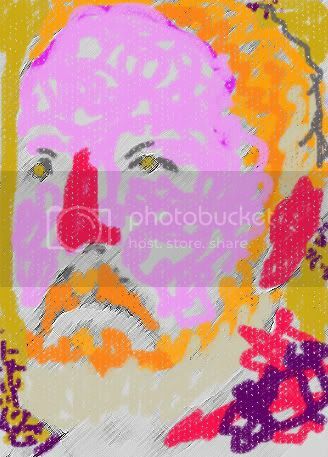 greywarenart.blogspot.com is one of the most outstanding resourceful websites of its kind. I take advantage of reading it every day. Keep it that way.